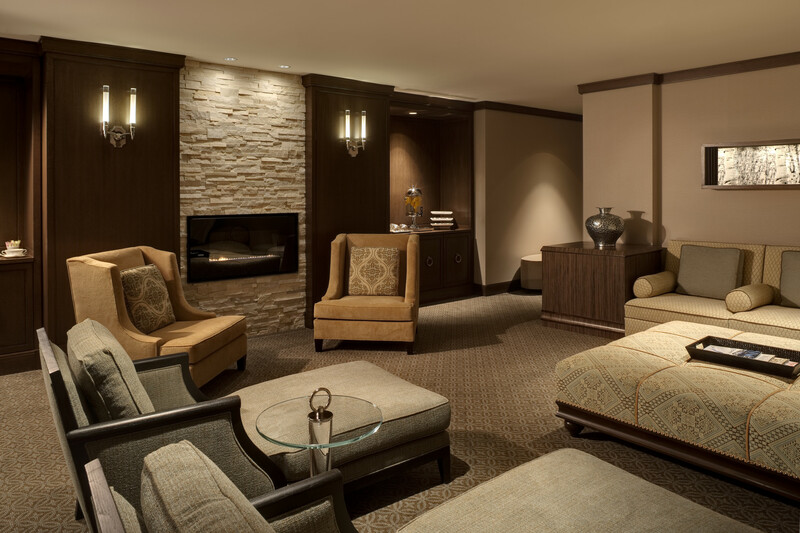 When you want a respite from the skiers whizzing down Park City’s trails or the din from the afternoon hot chocolate bar in the lobby, find sanctuary at Remède Spa at The St. Regis Deer Valley. 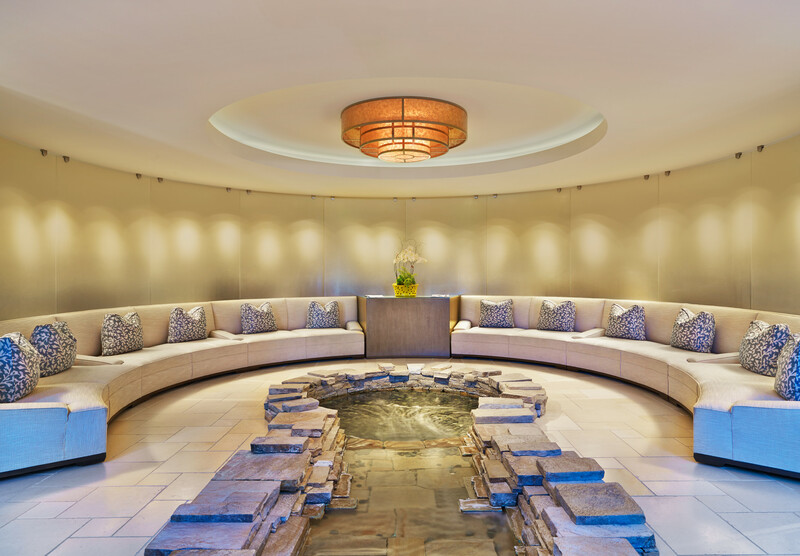 The luxurious spa is a quiet hideaway, whether you want a long, healing massage or a quick manicure. 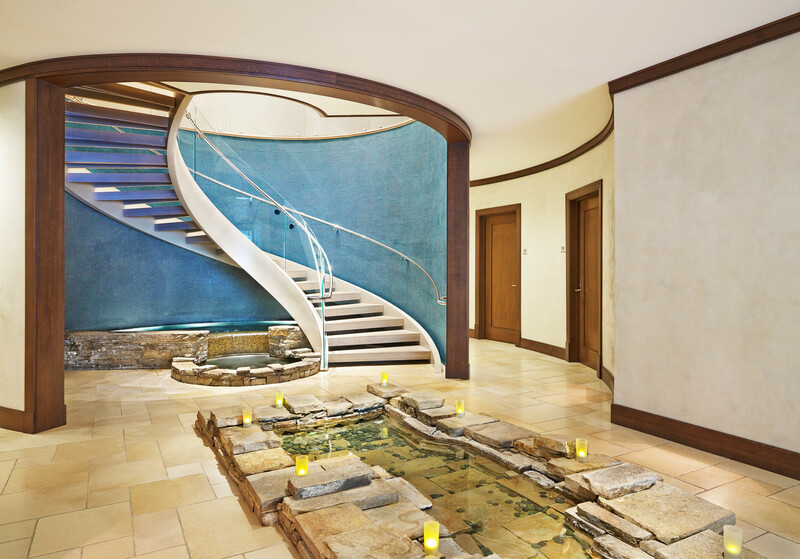 The spacious 14,000-square-foot spa fills two levels of The St. Regis Deer Valley and has a soothing atmosphere that reflects the natural colors and elements of the beautiful mountain setting. Punctuating the soft tan walls throughout, artist Milano Liberi’s stark, oversized black-and-white photos peer at bare trees from different angles. 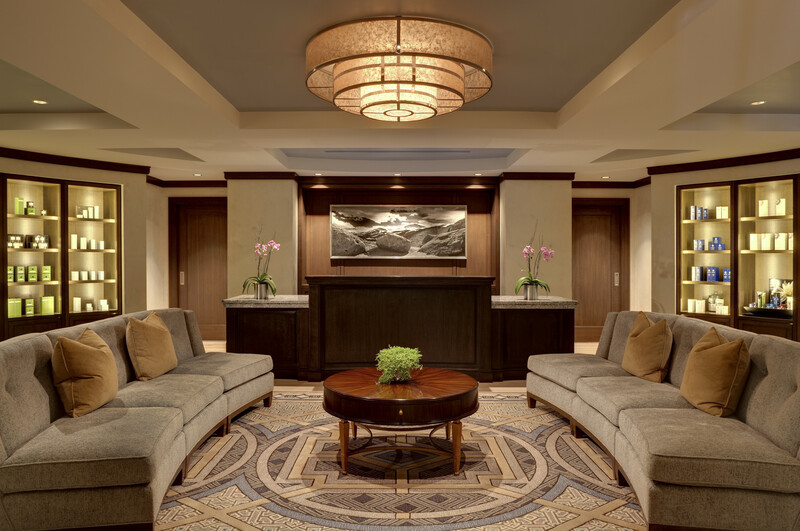 An intriguing design feature is a reflecting pool that flows from the outside and into the Four-Star spa’s first-floor lobby. A nearby grand spiral staircase adds an architectural element and naturally leads to the 11 treatment rooms. The candlelit relaxation room beckons, and the fireplace in the beige stone wall makes you want to cozy up on a padded chaise lounge with a copy of Harper’s Bazaar. For the most intimate getaway, we suggest for lovebirds to secure one of the two couples suites and enjoy relaxation time on the private heated patios after their dual massage. If you want to indulge in a few more services, peruse the waxing and nail menu (gel manicures and pedicures are available) before leaving this healing hideaway. If for some reason you cannot make it to your appointment, you will need to give the spa a heads up no later than 24 hours before your treatment time. We love that every service begins with an eye treatment. Cooling cucumber is mashed up and inserted into a porous mask to refresh your tired eyes, then it’s onto the main event. After some intense skiing, try the customized massage. Your therapist will pinpoint your sore spots and use aromatherapy and paraffin to get you back into tip-top form. The hot stone massage will zap the chill from a day spent outdoors, and the Thai massage will loosen your stiff limbs. 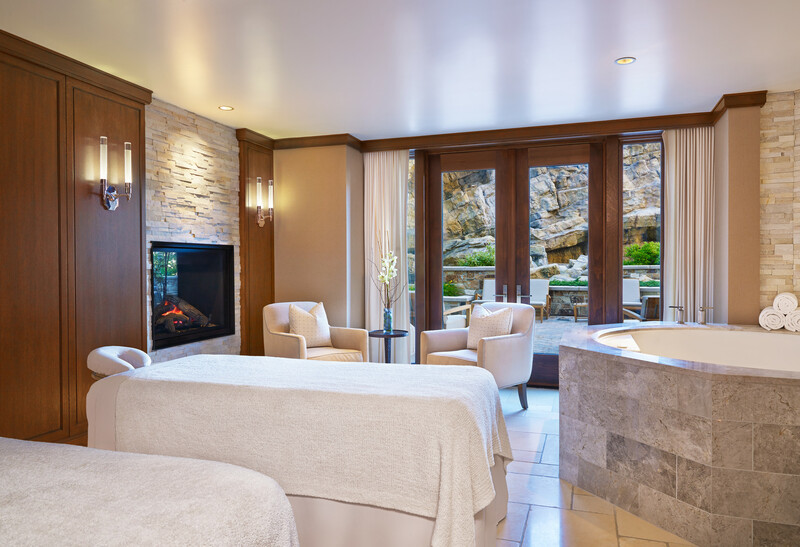 If your body is in need the works, opt for the all-in-one Deer Valley Healing Ritual, which includes a body exfoliation, an antioxidant-rich wrap, a facial, a scalp rub, paraffin treatments for your hands and feet and a massage. If you have chapped skin, opt for the replenishing Oxygen Infusion from Natura Bissé as an add-on to your facial, which includes hand and foot paraffin treatments and pure oxygen inhalation therapy. Linger in the dim relaxation room with a glass mug of organic peppermint Tealeaves tea (sweeten it with a little of the White Lion Tea crystalized honey pearls) and a plate of dried apricots, cashews and almonds. 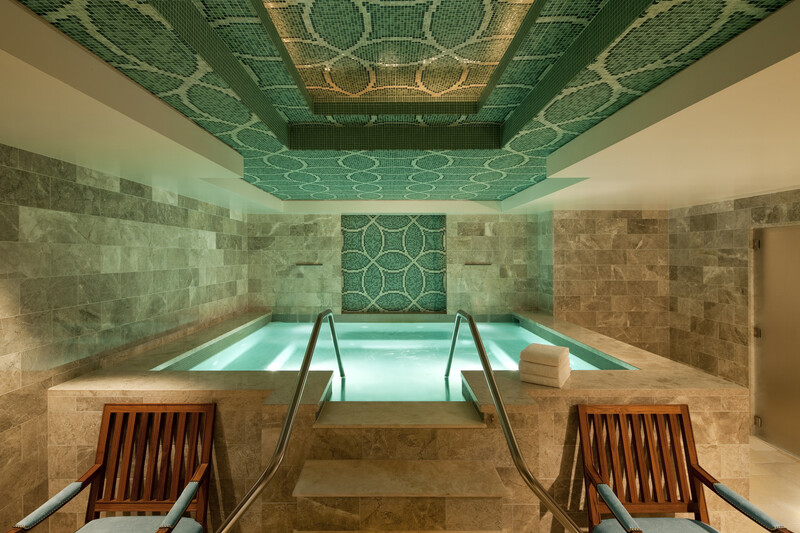 Once you’re refreshed, detox in the sauna or steam room, or unwind with a dip in the whirlpool, which sits up against an elegant aqua and navy mosaic along a tan stone wall (a larger mosaic covers the ceiling). If you’re feeling energized, visit the 3,000-square-foot gym for a session on its TechnoGym equipment or in a fitness class (yoga, Pilates, stretch, meditation). The mountain views are an added bonus, provided by the floor-to-ceiling windows. You’ll find everything else you’ll need to get ready in the vanity spaces, including makeup wipes, contact lens solution, brushes, nail files, curling irons, hair dryers, hair gel, mouthwash and toothbrushes with mini toothpaste tubes.